A detached Grade II Listed cottage constructed of timber framed elevations with inset colour washed panels beneath a thatched roof with an extension to the rear of stone elevations beneath a flat roof. The charming accommodation comprises two excellent reception rooms, kitchen with Aga and cloakroom on the ground floor, with two bedrooms and a bathroom on the first floor. A covered walkway and central porch links the cottage with an attractive detached annexe constructed of stone block elevations beneath a tiled roof. This has an open plan living room, double bedroom, kitchenette and shower room. Both the cottage an annexe share an area of off-road parking as well as well enclosed areas of garden. Agent’s Note: This may well appeal to those looking to generate an income from their property offering B&B or as a holiday let. The property is situated in the centre of the village of Broughton, which offers everyday amenities including a Post Office/store, doctors’ surgery, village hall, church, public house, Thai restaurant/second pub and a primary school. Situated on the Clarendon Way footpath, there is excellent walking in the surrounding countryside and on the renowned Broughton Down. The picturesque town of Stockbridge is about 4 miles away and provides a range of shops, hotels, restaurants, churches and a secondary school. The cathedral cities of Winchester and Salisbury are 12 and 13 miles distant respectively. There is convenient access to London and the West Country by road (M3 and A303) and rail, with main line stations at Grateley and Winchester. Stable style door into PORCH / BOILER ROOM (Located between the cottage and self-contained annexe) Paved floor. Oil fired boiler. Fuse box. Steps rising to oak panel door into annexe. Open doorway into covered walkway with roll top sill, high level cupboards and shelving leading to a door onto the High Street and door into Silverton Cottage. CLOAKROOM White suite comprising pedestal wash hand basin with splash back and low level WC. Obscure glazed window. Oak parquet flooring. Ceiling light point. Meter and fuse box. KITCHEN Oak parquet flooring. Oil fired Aga with double hob with splashback. Circular sink unit with corner mixer tap. Roll top work surface with tiled splash back, cupboards and drawers beneath, cupboards above. Door to understairs storage cupboard. Two windows to front aspect, further window to side aspect into covered walk-way. Two ceiling light points with spot lights. Radiator. PRINCIPAL BEDROOM (Spacious dual aspect double bed/sitting room) Windows to front and rear aspect. Substantial exposed chimney breast with built-in furniture to either side recess. Exposed purlins, wind braces and framework. Oak herringbone parquet flooring. Two radiators. Ceiling light point with spot lights. BEDROOM TWO (Small L-shaped dual aspect single bedroom) Oak herringbone parquet flooring. Windows to front and side aspects. High level storage. Exposed timbers. Deep built-in cupboard with hanging rail and cupboards above. Pendant ceiling light point. BATHROOM White suite comprising an oak clad bath with mixer tap/hand held shower attachment, tiled surround. Pedestal wash hand basin with tiled splash back. Low level WC. Oak herringbone parquet flooring. Windows to rear and side aspect. Cupboard concealing insulated hot water cylinder with fitted immersion, airing cupboard above. Ceiling light point. SPACIOUS LIVING / DINING ROOM Small pane glazed double doors to side aspect with windows to either side. Oak effect flooring. Down lighters. Radiator with display sill over. Oak panelled door into bedroom with kitchenette to side. BEDROOM (Double) Small pane window to rear aspect. Oak effect flooring. Radiator. Down lighters. Access to loft space via hatch. SHOWER ROOM White suite comprising wash hand basin with tiled splash back, mirror and strip light/shaver socket above. Low level WC. Sliding glass door into large walk-in enclosure with Mira Sport shower. Ceramic tiled floor. Towel radiator. Window. Ceiling light/heater. Extractor fan. Picket gate with flower border to side gives access onto wide paved path leading round the cottage to the entrance porch. Separate electric double gates off Plough Gardens give vehicular access onto a hard standing with space to park two to three cars, if required. The garden comprises two small areas of fairly level lawn and flower/rose borders. Stone wall retained border with numerous flowering plants and two small specimen trees. The garden is well enclosed on all sides by tall timber fencing. Timber garden shed with profile roof. Heavy duty oil tank screened behind stone walling. From Stockbridge proceed in a westerly direction (towards Salisbury) on the A30. After approximately 1½ miles turn left sign posted Broughton. Continue to the next junction and turn left into the village. 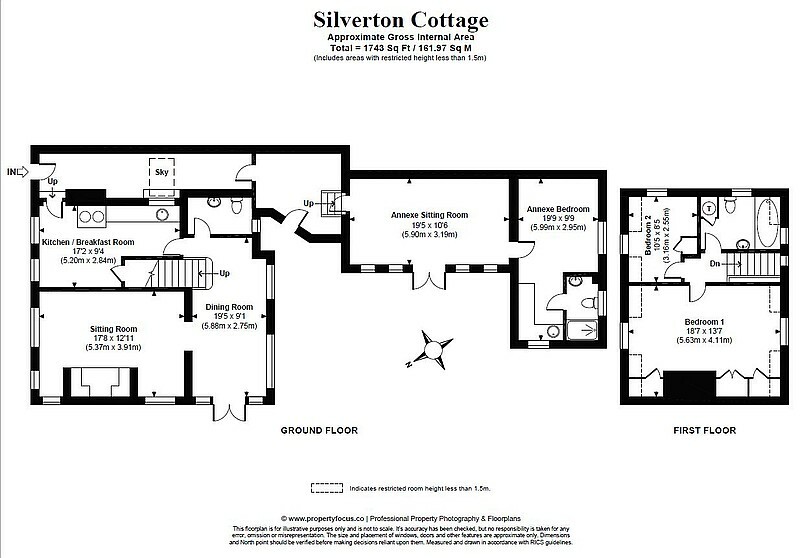 The property will be found on the right hand side immediately after passing the entrance to Plough Gardens.